From the beginning, God’s mission has been carried out by people sent around the world. From Abraham to Jesus, the thread that weaves its way throughout Scripture is a God who sends his people across the world, proclaiming his kingdom. As the world has evolved, Christian mission continues to be a foundational tradition in the church. In this one-volume textbook, Edward Smither weaves together a comprehensive history of Christian mission, from the apostles to the modern church. In each era, he focuses on the people sent by God to the ends of the earth, while also describing the cultural context they encountered. Smither highlights the continuity and development across thousands of years of global mission. "Ed Smither brings to us—in his own inimitable way—a concise and balanced history of Christian missions. He offers concision with balance—and it reads well. It is far from boring! This reads like the best of Kenneth Scott Latourette’s A History of the Expansion of Christianity and Philip Jenkins’ The Lost History of Christianity. Smither is a messenger of the Good News to remember all that God has done in the past, which gives us confidence for the present and hope for the future." --Allen Yeh, Biola University. Missionaries go into all the world and make disciples of all nations, while monks live cloistered in a monastery and focus their lives on prayer and studying Scripture--correct? Not exactly. When we study the history of Christian mission, especially from around 500 to 1500 CE, the key missionaries that we constantly encounter are monks. In fact, if we don't have monks in this period then we have very little in the way of Christian mission. 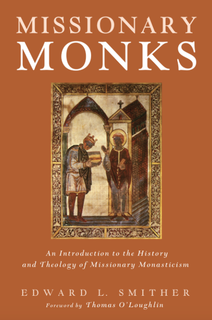 Our aim in this book is to examine the phenomenon of missionary monks--those who pursued both a monastic and missionary calling. We will meet the monks and monastic orders, narrate their journeys in mission, and evaluate their approaches to and thoughts about mission. Controversies in Mission: Theology, People, and Practice of Mission in the 21st Century. Pasadena: William Carey Library, 2016. "From a mission field to a missions sender." These words capture the story of the Brazilian evangelical church, which has gone from receiving missionaries in the nineteenth and twentieth centuries to becoming a movement that presently sends out more global laborers than the churches of England or Canada do. After narrating Brazil's missional shift, in this volume Smither addresses one fascinating element of the story—Brazilian evangelical efforts in the Arab world. How have Brazilians adapted culturally among Arabs, how have they approached ministry, and how have they cultivated a theology of mission in the process? This work gives the reader insights from one emerging missions movement with an eye toward a more comprehensive view of the global church. Along with the churches located in large Greek cities of the East, the church of Carthage was particularly significant in the early centuries of Christian history. Initially, the Carthaginian church became known for its martyrs. Later, the North African church became further established and unified through the regular councils of its bishops. Finally, the church gained a reputation for its outstanding leaders-Tertullian of Carthage (c. 140-220), Cyprian of Carthage (195-258), and Augustine of Hippo (354-430)-African leaders who continued to be celebrated and remembered today. "Decret and Smither have recognized our dependence on [North African] theologians and given us a thorough and well-presented introduction to that theology. They not only take the reader into that oft-ignored area, but they show why it is so important to appreciate that period." --Thomas O'Loughlin, University of Wales Lampeter. Lauded for his thoughts, Augustine of Hippo (354-430) has influenced virtually every philosopher of the last fifteen hundred years. But his personal character and ministry are even more remarkable, for in a time when most monastery dwellers sought solitude, Augustine was always in the company of friends, visiting disciples and writing mentoring letters to those he knew. Augustine as Mentor is written for modern day pastors and spiritual leaders who want to mentor and equip other evangelical Christians based on proven principles in matters of the heart like integrity, humility, faithfulness, personal holiness, spiritual hunger, and service to others. Author Ed Smither explains, “Augustine has something to offer modern ministers pursuing authenticity and longing to ‘preach what they practice.’ Through his thought, practice, success, and even failures, my hope is that today’s mentors will find hope, inspiration, and practical suggestions for how to mentor an emerging generation of spiritual leaders." Also available in Portuguese: Agostino como mentor. Sao Paulo (Brazil): Editora Hagnos, 2012.